This is the homepage of Castle Cab Interstate Transport, based in Greencastle, Indiana. We specialize in long-distance transportation between Greencastle and any place in the U.S., Canada, or Mexico (reservations required). 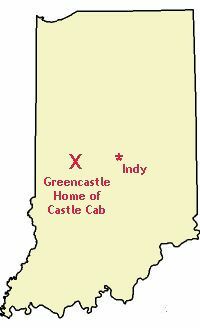 Runs must either be to or from the Greencastle, Indiana area. You can rest assured of riding in a safe, reliable, late model car. Castle Cab does not offer local transportation, as we are not a local taxi company. Rates are be based upon total trip distances, and a $40 minimum fare will apply to all trips. Going from DePauw / Greencastle to Indianapolis? Additional passengers on flat rates are $5.00 each, the total fare split among passengers present. Ride sharing is permitted, limited to availability of space. Rates shown for all companies listed do not include a standard 15% gratuity to drivers (this is optional at all companies shown). We do not accept credit cards, payment is due in cash. Round trip discount is available only on a single trip, and by reservation. This is 25% off the total of the individual one-way trips. To quality as a single trip, waiting time of .35/minute must be charged for all minutes of waiting. Thus, if you feel you are going to be at your destination for a particularly long time, it may be cheaper to reserve two separate trips, one for each way instead of reserving a round trip. We can accept reservations far in advance (years, in fact). It is recommended that, when possible, you reserve your trip at least two to three weeks in advance. Obviously, this is not always possible, and there is no requirement. We suggest it merely to decrease the likelihood of us being unable to fill a last-minute request for you. Due to the unique nature and size of the business (Greencastle is less than 10,000 people in total), we accept cash only. *Yellow Cab Indy, and Indy Airport Rates based on Yahoo! Maps driving distances and current published rates (as of 11/25/2006). *Additional charge for waiting time: .40/minute with Yellow Cab, .40/minute with Indy Airport Taxi, .35/minute after 15 free minutes with Castle Cab.